I’ve been knitting many things lately. But, they’re all small projects that I’ve been able to complete fairly quickly because they have no arms. These two are from Stephanie Japel. 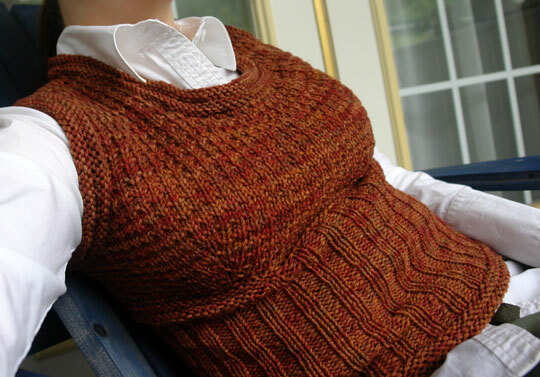 The first Stephanie Japel pattern is the Back-to-School u-neck vest from Fitted Knits. This yarn started out in a completely different project about a year ago. While I was in Toronto, I was desperate to knit something – anything. I bought some Dream in Colour handpainted (Chinatown Apple) superwash yarn from Lettuce Knits. And, I started to make a sweater with short sleeves, knit in the round – without a pattern. The knitting gods weren’t on my side and my Lantern Moon needles exploded mid-project. The needles were part of a recall, and you can get a free replacement if you have exploding Lantern Moon needles. It was for the best because it made me undo all my work. I started on this pattern a couple months ago. It fits perfectly – even if I’m not going back to school. I really love Stephanie’s book. I also love what seems to be her philosophy of simple patterns that are easy to knit in the round with little finishing. When I went on the Puget Sound yarn store crawl with Veronica, I found a fantastic deal on some Laines du Nord Cashsilk (50% unshrinkable merino, 25% silk, 25% cashmere). Yes, 25% cashmere for $5 a ball. I bought all nine balls that they had remaining thinking that I could make the Swan Lake cardigan from Interweave. I just didn’t have enough. Flipping through Fitted Knits, I realized I could make the Coquette Lace Tube Top. And, I was so excited. I started knitting. But, two repeats into the fairly basic lace pattern, things just weren’t looking right. Because I kept ending up with one extra stitch, I discovered that the book had a correction about the pattern. Before I ripped back, I tried knitting a yarn-over through the back of the loop to see what it would look like. So, it was at that moment that I discovered that I have been knitting yarn-overs wrong, well, since I’ve been knitting yarn-overs. The shaping in the pattern starts with smaller needles at the top and really helps the tube top stay up. I was worried that I’d need to add straps or figure out how to make crochet chains. But, it stays up. And, after consulting my knitting counsel, it’s staying as-is.